Millions of people are now tuning into podcasts to learn, laugh, and relax. With podcasts exploding in popularity in recent years, it's no surprise that businesses and individuals alike are using the platform to create unique and exciting content which can be shared globally. Transcription is the process of translating audio, into readable text either onscreen or in script format. Typically, this process is seen on television or live broadcasts but any recorded audio can be turned into easy to read text. Let's take a look at some of the reasons for providing transcripts alongside your podcasts. As audiences of podcast listeners continue to grow, the number of those unable to access podcast content rises. Like music, podcasts tend to rely on your ears to participate. This is a major barrier for many deaf or hard-of-hearing people who cannot gain access to podcast content when no supplementary transcripts are available. Providing transcripts of your podcasts, utilizing many free online services or apps, can expand your audience and upgrade your reputation as an inclusive and accessible podcast who cares about the needs of their listeners. When optimizing your podcast for search engines, you're more likely to draw traffic if you provide a transcript of the text. By transcribing the audio, people are able to search for your podcast content on search engines which creates an entirely new avenue for traffic. Currently, one major issue with podcaster's is their inability to promote their content outside of podcasting. Tom Webster, Senior Vice-President at Edison Research suggested that "there’s never been a mainstream effort, ever, to explain what a podcast is and why you’d want one.” This dilemma can be harnessed to your advantage. 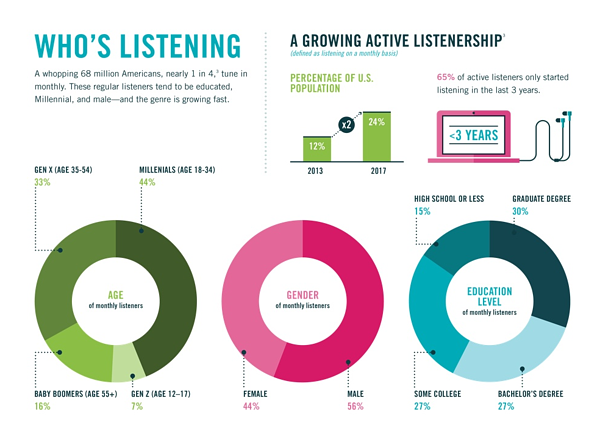 Estimates suggest the deaf and hard of hearing population of the U.S. is nearly 10 million persons, or 1 in 20 people. As podcasts (for the most part) rely on audio, we can assume that there are currently ~10 million people who are not aware, or have never heard of deaf friendly podcasts. This is a fantastic opportunity to brand your podcast to millions of individuals who would be thrilled to learn of accessible content, especially if it meets their needs: entertainment, news, educated etc. A majority of first time visitors to your podcast may prefer to read a transcript to gauge how worthwhile the content is. Although this is a given for deaf audiences, those not afflicted by hearing difficulty would also enjoy the ability to read through transcripts, and avoid the distractions and discomfort listening may potentially cause. Social media is the main driving force behind any good podcast. By generating transcripts, or text examples of your content, you can make your podcast immediately easier to share on all social media platforms. Things like quotes, highlights, or interviews are easier to share when available in text-form and increase the viral potential for your content. When considering transcribing your podcast, the user should be at the forefront of your decision. Making the user experience of your podcast as accessible, simple, and comfortable as possible is a major way to accumulate a loyal and dedicated audience. As well as foster an environment that many would consider thoughtful and attentive to their needs, which is the key to great customer satisfaction. You're likely to earn the respect of audience members who appreciate transcripts by offering them content in their preferred format. Transcription isn't a tedious process, nor is it expensive! Ai-Media provides quality, speedy, and affordable delivery of transcribed audio utilizing modern captioning technology, such as Communication Access Realtime Translation (CART). Here, we can ease the pressure of self-transcription and handle your audio.